Since 2015, Viki Male has worked as a principal investigator at the Institute of Immunity and Transplantation, UCL, researching natural killer cells in the liver. She is funded by the Royal Society and Wellcome Trust-funded Sir Henry Dale Fellowship. 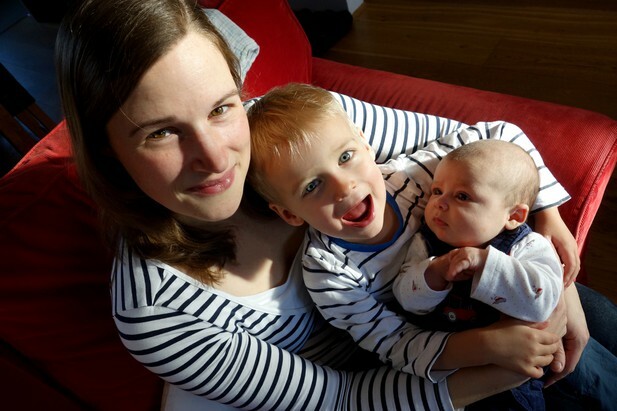 Viki’s first child was born in 2013, at the end of her first postdoc (at Imperial College London). Her second child was born in 2016, for which she took six months maternity leave. Viki Male with her two children. Image credit: Paul Moyses. I got married at the beginning of my PhD and we always intended to have a family, although not straight away. My PhD was in reproductive immunology, so I saw a lot of women who struggled to conceive – for this reason I wanted to have at least my first child before turning 30. My husband and I were also keen to have children while our parents are still young enough to be involved with them. On the other hand, I didn’t want to start a family until I was an established scientist, with my own funding. But as I approached the end of my first postdoc at 27, I discovered that the average age for a UK scientist to secure their own funding is now 38, so we decided to just go ahead. The timing of the pregnancy meant that I was able to finish the project and publish my first high-impact paper. But my contract ended a day before my son was born, and instead of being on maternity leave, I was effectively unemployed. Perhaps naively, I thought it wouldn’t be too difficult to return to science when I was ready, but actually, it was a real struggle. I applied for lots of postdoc positions but didn’t get any of them. It was a very difficult time for me and I nearly left science. However, desperation pushed me to apply for funding I assumed I didn’t have enough experience for, and so I applied for a Royal Society and Wellcome Trust-funded Sir Henry Dale Fellowship. I wrote the application sitting on a park bench in between pushing the buggy and, to my surprise, it was funded! So, in the end, I did start my own lab shortly after my 29th birthday. Ironically, if I hadn’t had the baby, I don’t think I would have applied for a Fellowship so soon. Once I was settled in my new lab, I decided the time was right to have a second child. Again, I timed it quite carefully so that I would have enough time to finish my first senior author paper before going on maternity leave. My paper was published the same day my daughter was born. I took six months maternity leave, from which I have recently returned. The big challenge now is balancing my lab work with getting two small children to and from different childcare settings. My sources of support have been different with each of my children. Since I was out of work during my first maternity leave, I relied financially on my husband. He had to work such long hours that we hardly ever saw him, and when I did go back to work, I did all childcare out of nursery hours. During my second maternity leave, I received maternity pay from my funding body, as well as UK statutory maternity pay. My funding body, the Wellcome Trust, have been great. They also extended my Fellowship by the amount of time I took off for maternity leave, including extra funding for research expenses during the extension period. My husband was able to take a role with more sensible hours and he is now able to take care of the children before and after nursery on three days a week. Being unemployed after my first child was born was very difficult for me, and I know lots of scientists who have experienced something similar. It’s caused by the culture of short contracts we have in science. My biggest challenge now is having to take time off work if one of the children is ill when I have experiments planned. The only way to make it work is to do my experiments during the night. It’s great that funders now account for the time spent out of science for family reasons when they’re assessing your productivity. But it should also be recognized that shortly after maternity leave you are likely to be less productive than you’d normally would be – and for good reasons. For example, I returned to work when my daughter was six months old, but I was still breastfeeding her and I had to take time off during the day to express milk. I also couldn’t work nights during that time. There is never a good time to have children. If you do it in the middle of a project, you lose productivity. If you do it at the end of a project, you risk a period of unemployment. So, you might as well do it at the time that feels right for you personally. For me, the rewards of family life were greater, and the impact on my productivity less than I expected, so I’m glad I took the plunge. How do you think the challenges of being a scientist and a parent compare with the challenges faced by other professionals who are also parents? As scientists, we have both greater and less flexibility than other professionals. If I need to leave before 5pm in order to get to nursery in time for pickup, no one is going to stop me. On the other hand, we’re bound to our labs when doing experiments. My husband (who is not a scientist) sometimes works from home in the evenings, or if one of the children is sick, which is not always a possibility for me.